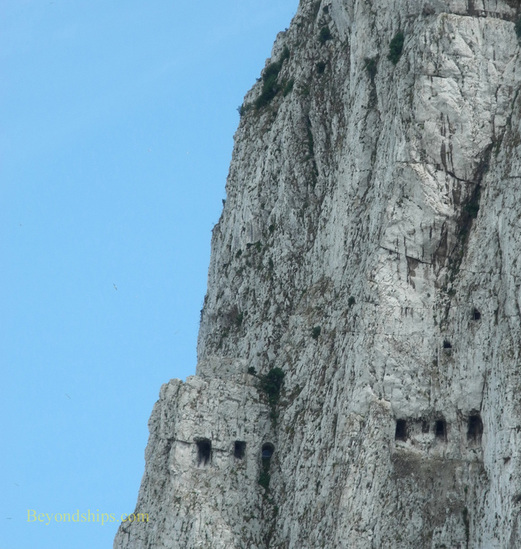 People used to say: “It is as solid as the Rock of Gibraltar.” However, in reality, the Rock is honeycombed with some 30 miles of interconnected tunnels. These tunnels were constructed for military purposes over the centuries and some are still used by the British Ministry of Defense. 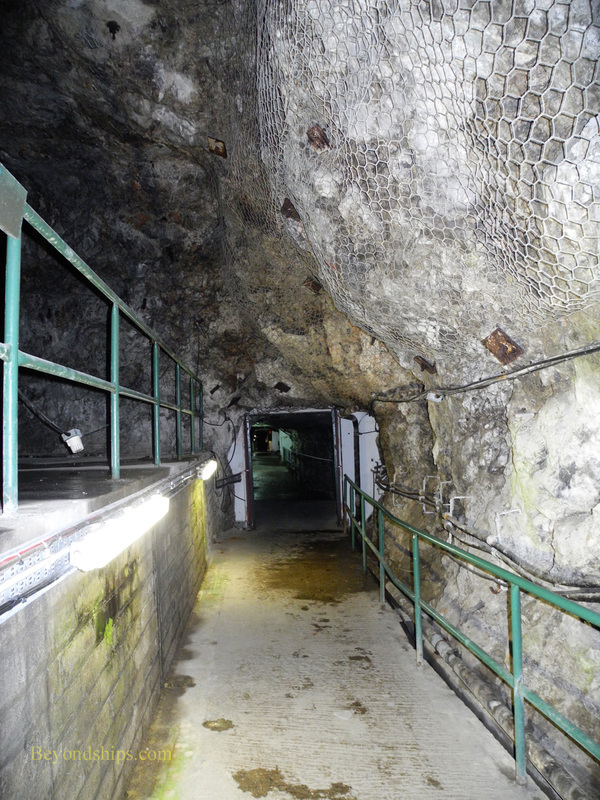 However, a portion of the tunnels carved out of the Rock during World War II are now open to the public. 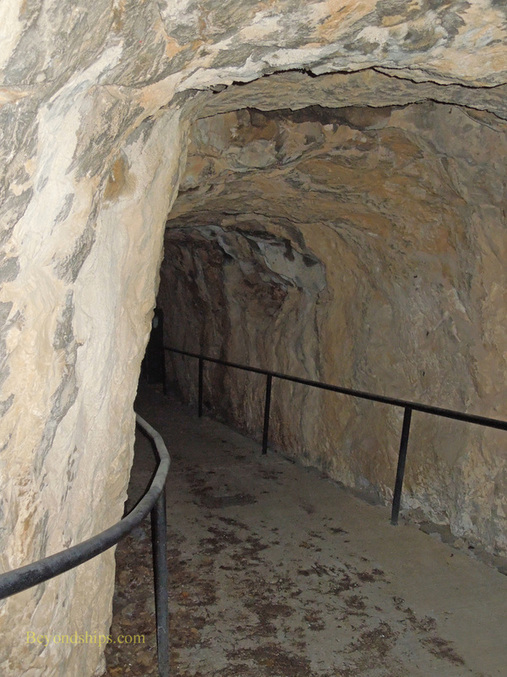 The first tunnels in the Rock were constructed at the end of the 18th Century. France and Spain had sided with the American colonists in their War of Independence and had placed Gibraltar under siege from 1779 to 1783. In order to strengthen the colony's northern defenses during the Great Siege, the British excavated a series of tunnels out of the Rock using sledgehammers, crowbars and some gun powder. Cannons were placed in embrasures in the almost vertical North Face of the Rock, which looks out towards Spain. These defenses were enlarged and strengthened during the 19th Century. During World War II, the British again became concerned that Gibraltar might be besieged. The Rock's location overlooking the Straits of Gibraltar gives its owner command of the western entrance to the Mediterranean. 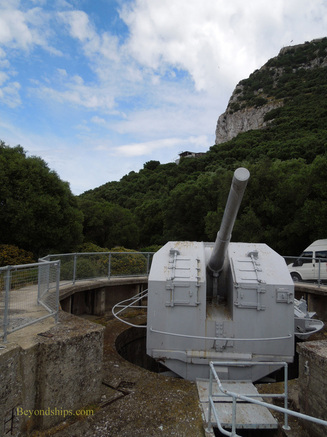 Modern cannons located atop the Rock could make it very risky for any hostile surface ship to attempt to go between the Atlantic and the Mediterranean. Therefore, if Gibraltar could be taken by the Axis, the British and their Allies would find it very difficult to counter any German or Italian moves in the Mediterranean. In addition, the British would lose a valuable harbor, which served as a base for ships carrying out operations in the Atlantic. A German and/or Italian attack on Gibraltar seemed probable in the early part of the war. With the fall of France in 1940, only the territory of neutral Spain stood between the German and Italian armies and Gibraltar. Spain had long hoped to re-claim Gibraltar. Furthermore, the Spanish dictator General Francisco Franco had come to power during the recent Spanish Civil War with help from Hitler and Mussolini. Indeed, the Germans were planning such a move, codenamed Operation Felix. At first, they attempted to persuade Franco to enter the war on their side. Later, they hoped he would allow a German army to transit still neutral Spain in order to attack Gibraltar. However, Franco did not want Spain, which was still recovering from the ravages of its Civil War, to become involved in another war. Rather than say no to his former benefactors, he simply made extravagant demands for Spain's participation that the Fascist dictators could not meet. Consequently, Operation Felix was never implemented. Of course, the British were not in a position to know Franco's mind or to know how long Hitler would tolerate being led on. Therefore, they acted to strengthen Gibraltar's defenses in the event of a siege. The plan called for a virtual city to be built inside the Rock with its own power station, hospital, laundry. Sanitary facilities and water supply. It was to be capable of allowing a garrison of thousands of soldiers to resist a siege for a year. Four companies of British engineers and a Canadian tunneling company were given the task of building the underground city. They worked for months at a time, sometimes without seeing the light of day for extended periods. They also had to contend with dirt and dust from their excavations. Moreover, because water was in short supply in Gibraltar, they had only limited opportunity to wash off the dust and grime. Debris from the tunnel project was used to extend the runway of the Gibraltar airfield out into the bay. This made the airfield more valuable as it could now be used by larger aircraft. In fact, it played a significant role during the Allied invasion of North Africa in 1942. 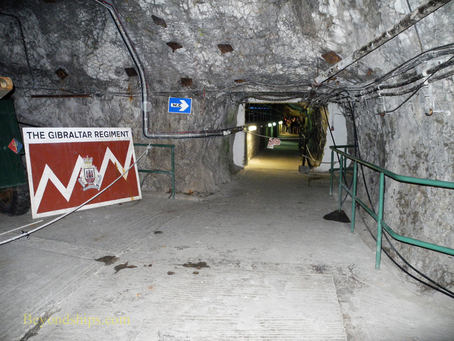 The completed tunnels were used by the British military during the war and during the post war period. Above: The North Face of the Rock with embrasures and other openings from the tunnels. Below: The entrance to the Willis Gallery, one of the 18th Century tunnels. Above: A World War II tunnel. 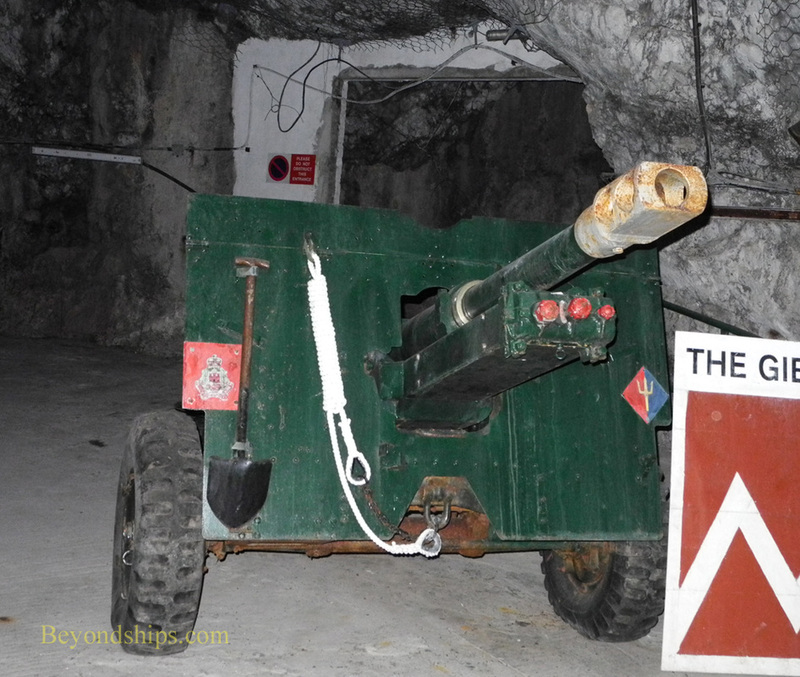 Below: A British Army field piece on display in the tunnels. Above: The interior of the Hays Level entrance. Below: A natural fissure in the limestone. Above: A room carved into the rock. 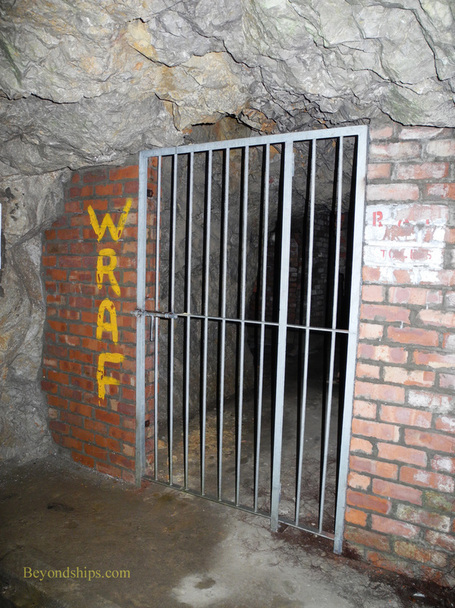 Below: Although almost all the occupants of the tunnels were men, there were also a few women from the Royal Air Force, Their area was given additional security. Above: The view from Jock's Balcony. Below: A gun at Princess Anne's battery. 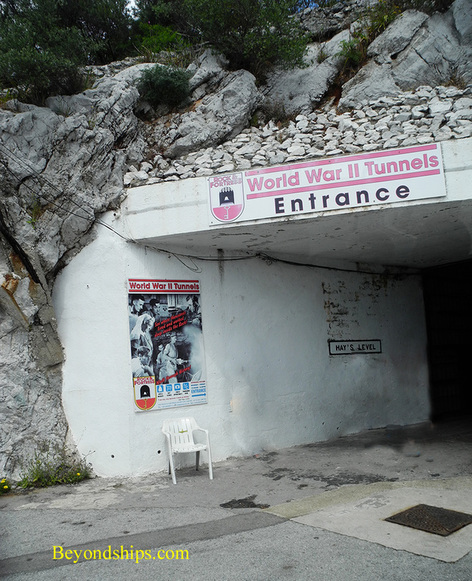 The portion of the tunnels that is open to the public is about midway up the Rock towards its northern end. Its entrance is at the Hays Level and looks like the entrance to a bunker in a movie about World War II. In a large chamber carved out of the stone, we met our guide. You need someone who is familiar with this labyrinth of very similar looking passages in order not to get lost. Also, inasmuch as almost all of the World War II artifacts have been removed, you need someone who knows the story in order to bring the tunnels to life. Overhead, wire mesh had been bolted onto the rock to catch pieces of the stone before falling onto the paths. Nonetheless, as an added precaution, our guide handed out hard hats to each member of the group. One member of the group took this opportunity to express concern about being in a confined space. The guide assured her that the tunnels that we would be seeing were large and that there was plenty of air. As it turned out, in this respect, the experience was little different than going into a subway in a major city. Most of the excavation of these tunnels was carried out using contemporary drilling and blasting methods. 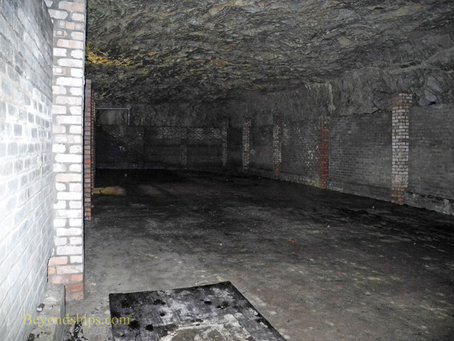 The ceiling and walls of the tunnels were left as exposed stone while the floors were paved with concrete. A gutter for carrying off the rain water that seeps through the rock was built next to the paved foot path. At various points, the engineers came across natural faults in the limestone. They did not attempt to cover these fissures and they are still open to view. 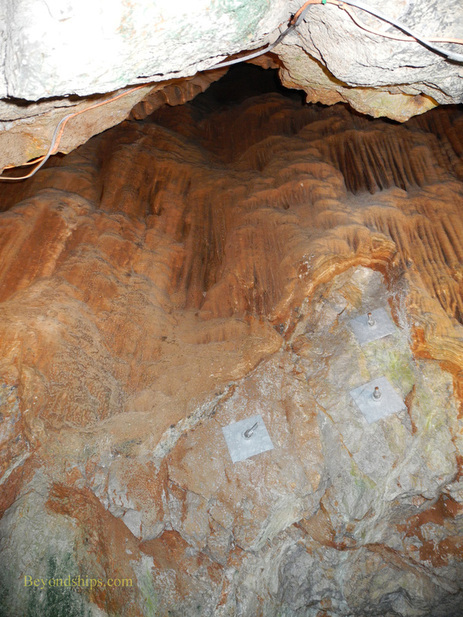 Rain water has leached minerals out of the stone making them colorful and forming stalactites over millions of years. Our guide pointed out that tiny versions of these are also forming in the man-made caverns as well. From time to time, the tunnels open out with large chambers on either side. The engineers used diamond drills to carve out these rectangular spaces, which have corners with precise looking 90 degree angles. These now empty chambers were once used as offices, working areas and as barracks. While they look like rooms in a building, the desks, beds and other furniture were not simply placed in the carved space. Rather, to insulate the occupants from seepage and the coldness of the rock, houses were built inside these chambers. Some were standard corrugated steel Nissan huts while others were houses built of concrete blocks. With the hope that the occupants might forget that they were underground, the houses were built with windows with frosted glass. The various tunnels were given names in order to make it easier for the occupants to remember the layout. Similarly, the intersections where the tunnels meet have names. For example, several tunnels come together at Clapham Junction, named after the well-known railway hub in England. Perhaps the most interesting feature of the tunnels is Jock's Balcony. This is an observation position built by Scotland's Black Watch regiment in 1941. 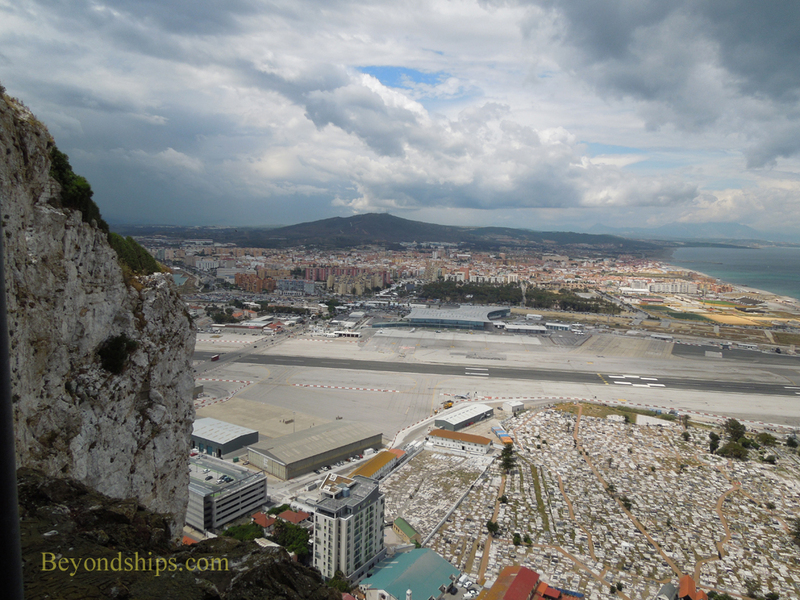 It opens out onto the sheer North Face of the Rock and provides a spectacular view of the airport, the sea and the Spanish coast. However, in order to get to it, you do have to squeeze through a series of small spaces originally designed to prevent the blast of any shell that might hit the balcony from penetrating into the tunnels. Visitors exit the tunnels onto Willis' Plateau where several large cannons are located. This is Princess Anne's Battery. These cannons were once naval guns and so are painted battleship gray. However, they were used here as an antiaircraft battery. Gibraltar was bombed by both the Vichy French and the Italian air forces during World War II. The guided tour lasts approximately a half hour.